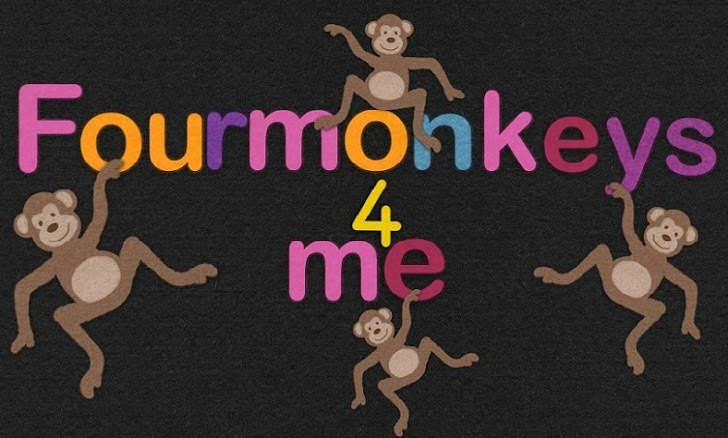 Four Monkeys 4 Me: Ten Giggly Gorillas - A Wasabi Productions App Review! Ten Giggly Gorillas - A Wasabi Productions App Review! I downloaded this app, and immediately opened it up because the name is catchy. It begins and this amazing Australian accent comes on, and starts to read the book. Cute, catchy rhymes sing out to me. Basically, it's a countdown from 10 gorillas in the tree right down to one. On top of this, it's an interactive book. It gives you directions on how to find the proper gorilla to tickle to make it jump out of the tree, in the rhymes! The gorilla that jumps off the page is also highlighted. You can also touch the other gorillas and they have these cute sayings that they'll say to you, or they'll move about on the page. Super cute! On top of just touching the appropriate gorilla, you can search for a toucan on each page. Now I've got to say, even I found it difficult to find that trickster toucan on some of the pages, but on others it's way more obvious. I strongly suggest that the developer considers adding the ability to change the difficulty for this part. I was in this fit of giggles over the rhymes and these silly gorillas dancing and diving off the pages. Our youngest, Martyn (18mos) doesn't normally sit through book apps. Out of all the book apps we have (around 100) there are maybe two? that he'll actually sit and listen too. We can now add this book to the list! Here's a little video clip of him and dad with this app. He absolutely loves listening to the gorillas say Not me! Nuh huh! He's such a silly guy. "The toucan can be a little hard to find, but when you can see part of it's beak, it's not too bad. The gorillas sure are funny!" "5!!! It is a great book! The gorillas are so much fun!" I think he nailed it on the head. Super cute, fun and interactive book app. As an added bonus, this app also comes with a memory matching game at the end- we haven't actually used this yet, because my kids just keep replaying the book! We loved at our home too!